Last night more than 100 people gathered in the sanctuary of the Newport Mesa Church on the campus of Vanguard University in Costa Mesa for a forum on Homelessness hosted by Costa Mesa City Councilmen John Stephens and Allan Mansoor. 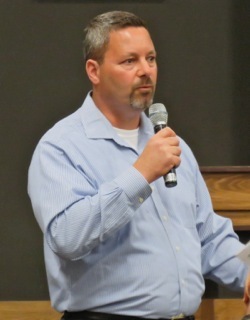 The evening was moderated by Assistant City Manager Rick Francis and included serveral "subject experts" on this issue to provide insight and perspective. It's been a busy week for him - he moderated the discussion on Measure X the afternoon before. Following opening comments by Mansoor and Stephens, Francis led off by introducing members of his "team", city employees and volunteers who provide active support to the Network for Homeless Solutions. 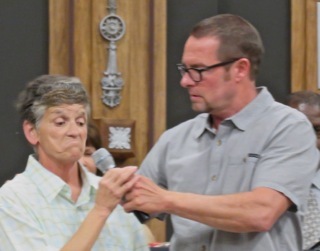 Among those introduced were Code Enforcement Officer Mike Brumbaugh, former Planning Commissioner Jeff Mathews, Pastor Ian Stevenson, Executive Director of Trellis, Pastor Bill Nelson of Fresh Beginnings Ministries and consultant Muriel Ullman. 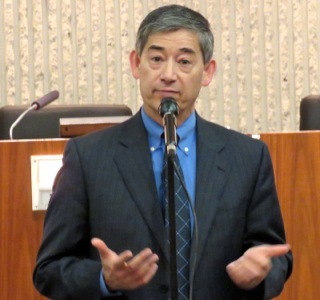 Francis gave us some perspective on the scope of the Homelessness issue in Costa Mesa. He told us that 269 individuals have been directed to housing, of which 203 are still housed. 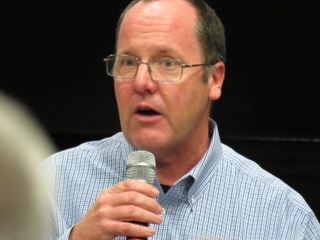 He affirmed that his group doesn't just put folks on a bus, plane or train without them actually having a place to house them at the other end. He said, "We don't just ship them out to nothing." 3 - Integrate law enforcement, mental health and legal strategy as a collaborative approach to reducing homelessness. Initiated 4638 contacts with Costa Mesa Homeless Individuals. Placed 269 individuals in permanent housing. Made 2280 Linkages to substance abuse, medical and mental health services. Performed 617 other supportive services actions to assist the homeless population in Costa Mesa. Since 2013, when this program began, of the 269 individuals housed, 38 were housed in 2013; 50 in 2014; 92 in 2015; 89 in 2016. Of those housed only 12% were housed in Costa Mesa. 44% were housed in other Orange County cities; 9% were housed in other counties in California; 13% were housed in other states and 22% were housed in "other". He also showed charts demonstrating the kinds of services and percentages of hours spent by four faith-based partners in this effort. 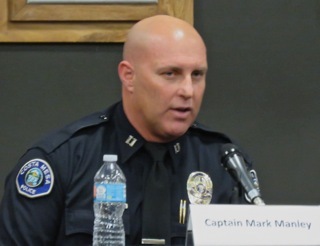 Captain Mark Manley of the Costa Mesa Police Department who heads up Field Operations for the CMPD. 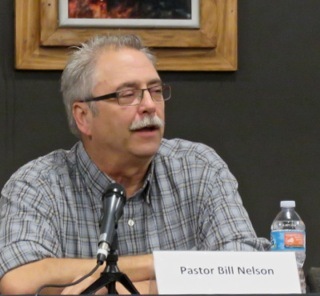 Pastor Bill Nelson of Fresh Beginnings Ministries, who has worked with the homeless since 1986 and whose organization has fed 49,000 people. 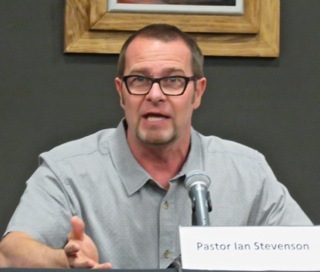 Pastor Ian Stevenson, the Executive Director of Trellis. 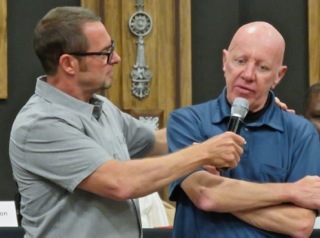 He was a pastor at Crossings for 26 years. He coined the phrase, "We're better together", describing the collaborative effort among the various participants. 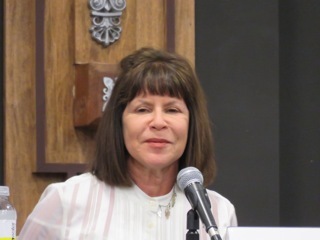 Muriel Ullman, a former Costa Mesa City employee who now provides consultative support for the Network for Homeless Solutions and is the main focus of City activities. Among the things she's been involved in is attempting to set up a "mini-county" outreach program, but better. She spoke about the difficulty of getting good contract staff, so the City has designated staffers to work on this issue. She described the job is one that attempts to achieve a balance between the homeless and the residents. 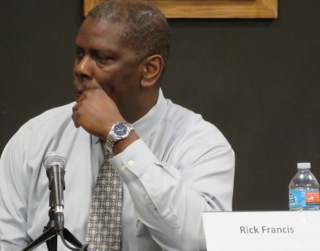 Rick Francis was the other member of the panel. Among the things he spoke about in his introduction on the panel was the question, "Why does it appear that the homeless problem has grown?" Among the contributing factors was ineffective legislation - AB 109 and Prop. 47, for example, which resulted in more homeless folks state-wide. Also, the growing proliferation of rehab homes in Costa Mesa has produced a large number of homeless as failed clients are "curbed" - dumped on Costa Mesa city streets without any means of support. He spoke of the creation of the Network for Homeless Solutions and said many Orange County cities have modeled their efforts after it. Members of the audience then asked questions of the panel. 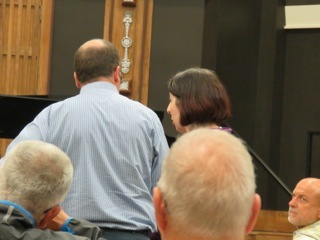 Mansoor and Stephens scampered around the sanctuary with wireless microphones to the speakers, and occasionally offered their views on the issue at hand. What kind of assessment is done for mental health homeless folks? Ullman and Nelson responded to that one with statistics of the number of assessments done - more than 200. The level of mental illness - it's a wide range - depends on the kind of services provided. Many people ask about using the Fairview Developmental Center property for a homeless site. The responses included the fact that the sale of that property is still a few years off - 2021. The City has designated that site for specific types of uses in the most recent General Plan Update. If the State chooses to transfer that land to another state agency the City can do nothing about it. There are a lot of moving parts and the City has no lock on the land - no rights to it. The issue of "curbing" was discussed. The City has recently discussed a new ordinance, modifying existing Sober Living ordinances, which will soon appear before the Planning Commission. What about a campground for homeless? The reply was, "I don't know where we would put it!" Francis went on to state that what is really needed is housing. He spoke of the situation in Anaheim, where officials dislodged homeless from the riverbed and an encampment was created near a mobile home park which has turned out to be a serious safety problem. What can we do to help with the political process? The answer was to pay attention to current and proposed legislation - State Senator John Moorlach's bill, for example. Francis referred folks to Scott Carpenter in Moorlach's local office. What about crime by homeless? Manley said it's a complicated issue. Simply being homeless is not a crime. He described the collaborative effort with the faith-based organizations and improving communication. He said the CMPD handles over 100,000 calls for service each year and they don't want to handle the same one over and over again. In response to the question about "who do we call", the answer was, "Don't wait for a response to an app." - if you feel you're in an unsafe situation, threatened, by all means call the CMPD. Locking bathrooms and removing picnic shelters in the parks? 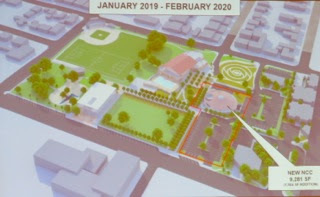 A lengthy discussion took place on this issue, describing the closure of bathrooms at Lions and Wilson parks as extreme measures dictated by criminal activities being conducted in those facilities. Speakers bemoaned the loss of the bathrooms, especially for children. It makes the parks unusable for some of them. Stephens, addressing this issue, said he's going to ask the City to take a fresh look at this issue, to try to find a better solution. What about feeding the homeless? Several groups apparently regularly feed homeless folks in parks and elsewhere. Stevenson spoke of the difference between a hand out and a hand up. The objective is to not just provide a sandwich to a homeless person, but to connect with them and help direct them to much more substantive services available to them. Get to know them. Nelson spoke of asking the person to "tell me your story" - to build rapport and confidence. He said they've served over 61,000 meals over the past 3 years and that each should come with a prize, not a price. 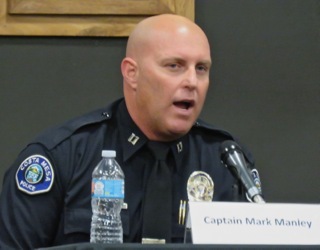 Manley spoke of his Community Policing Team, indicating that they were working on a daily basis at Lions Park. He also mentioned the state legislation, which is not helping local law enforcement at all. He spoke of "Hybrid Homeless" - folks who are down and out with drug syringes in their pockets. He expressed the view that it's frustrating and exhausting because of the number of those who return, time after time. He said he "loves to put people in jail", but that's not a solution to homelessness. With only 18 beds in Orange County, how do we deal with that? 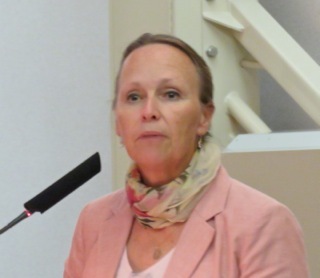 Ullman spoke of relationships, and cited Redgate, which provides county housing. 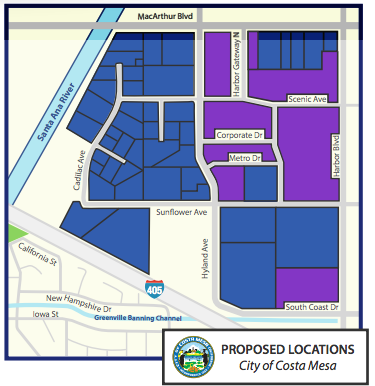 Yes, there is a NEED for housing in Costa Mesa. Francis referred to a facility in San Antonio, Texas that he has visited that may be a model we can follow. Stephens, Mayor Katrina Foley (who also attended this meeting) and staffers will journey to Texas to view this site next week. How do we deal with folks that don't want help? Ullman responded that we don't want those people around. She gave an anectodal story about one specific individual to elaborate on that issue. Mansoor again spoke of the failures of AB109 and Prop. 47. Francis spoke of the huge uptick in addiction problems nationwide. He also spoke of one community that addressed the homeless housing issue by creating a village of "tiny houses". 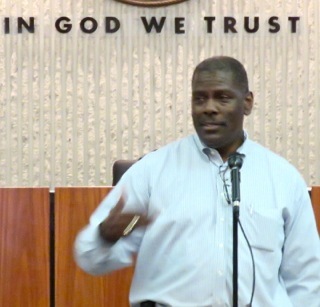 Stephens observed that only housing 12% of our homeless in Costa Mesa is not acceptable. Should there be a taskforce for drug addicted homeless? Before the meeting closed testimony was provided by two freshly-scrubbed formerly homeless folks who have been helped by the efforts of the groups involved. Marie described the tragedies in her life that placed her on the streets and the assistance she received to now have a home. English Joe described his path to homelessness and now, through the help he has received, he has a home, job and a car. 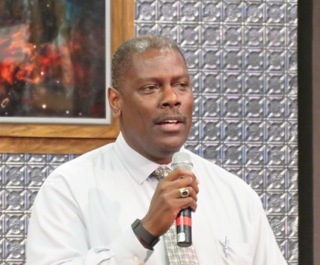 The meeting was closed with a prayer led by Pastor Stevenson. My take on this meeting? First, a lot of work has been done by City staff, led by Francis and many others, to actually address the homelessness problem in the city. The theme of "collaborative efforts" was a thread through most of the discussions. The statistics bear out that progress is being made, but the problem is far from solved. Many of the attendees were legitimately concerned about the safety of the homeless, and of the safety of the residents who deal with them. We continue to look for solutions, as mentioned above. The impact of Sober Living Homes cannot be ignored in this issue. Failed clients who are summarily dumped onto our streets become a big - very big - part of our homeless problem. Foley recently told us about her trip to Sacramento to lobby for a bill in the Assembly that would house a state inspector of licensed Sober Living Facilities in Orange County on a trial basis - she actually offered space at City Hall for such an inspector. 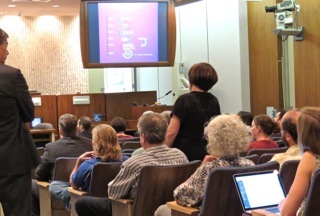 She told us that there are 108 state-licensed Sober Living Homes in Orange County, and that Costa Mesa has 82 of them! That is a staggering number, and doesn't really define the problem because it doesn't account for the hundreds of unlicensed facilites that infest our residential neighborhoods. 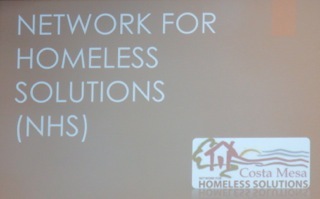 Kudos to Rick Francis and all the folks who make up the Network for Homeless Solutions. Each individual - from Mike Brumbaugh who holds business owner's feet to the fire on the security of their properties, to Muriel Ullman who helps guide this little boat through pretty darn treacherous seas and the other organizations who play a large role in trying to help manage this issue. Although there certainly appears to be "management infrastructure" in place to appropriately addess this issue, as is the case with most issues facing city governments, money is a key. We need money to hire more law enforcement officers. We need money to try to find a place for homeless housing. There seems to be a will by our elected leaders to "do something" about this problem. Let's hope it bears fruit, and that we see the number of homeless folks on our streets reduced - it will likely never be eliminated. Barry Friedland of Costa Mesa Brief was on hand to make a video record of the event. That record should be up on his YouTube Channel and available for viewing soon. Measure X Stakeholders Meet For "The Rules"
You will recall that I did a preview of the Measure X Stakeholders meeting, HERE, of the event that was held in City Council Chambers from 2:00 - 3:30 today. In that entry I gave you some handy links and a map of where this activity will eventually be permitted. That map is below. 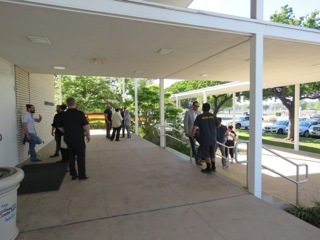 When I arrived at City Hall a few minutes before the starting time I was impressed with the number of people milling around on the Council Chambers porch. This was unusual, and was compounded by the crowd I found inside the room. Eventually, when the meeting began, I estimate there were upwards of 75 people in the auditorium - and more than a few of them were folks you'd never invite to dinner. 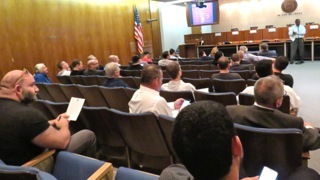 In all my years of attending meetings in Costa Mesa I've never felt as uneasy as I did during this one. I found myself thinking, "Well, if this is the kind of folks we are inviting to do business in our city, I'm not happy about it... at all!" 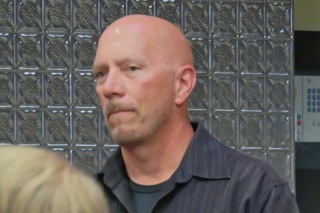 Assistant City Manager Rick Francis was the point man on this event and he moderated the discussions. He was supported by Chief of Code Enforcement Fidel Gamboa and Zoning Administrator Willa Bowens-Killeen. Also there to aid in the presentation was David McPherson of HDL, the consultancy that provides us with Sales Tax information and also consults in these kinds of issues. 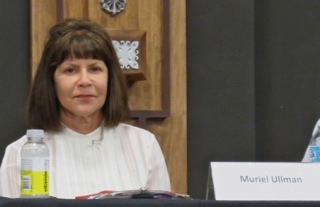 Also in attendance was City Clerk Brenda Green, Interim Development Services Director Jay Trevino, consultant Sherry Vander Dussen, Interim Finance Director Steve Dunivent, Captain Bryan Glass of the CMPD and several other city staffers. Francis took the lead and told the crowd they were going to present a broad overview of this issue and would deal with permits, fees, etc. He said, "Not many cities are doing specifically what Costa Mesa is doing, so it will take a long time." He said it's "not going to be a two week, or two month process." The crowd murmured. He told us that at the April 18, 2017 City Council meeting the council will hear the fee recommendations. He then introduced many of the staffers present and described their roles briefly. 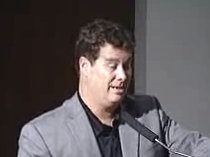 He also introduced David McPherson of HDL. 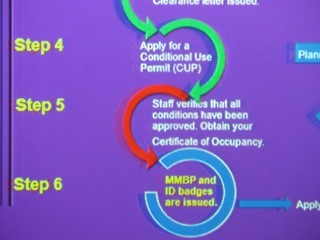 He introduced the Conditional Use Permit (CUP) process briefly, indicating that state law requires a 60 day wait after adoption of the fee schedule and the CUP process could take 8-12 weeks, depending on many variables. Fidel Gamboa then took over and walked the audience through a slide show on the application process. You can see the slide above for reference. 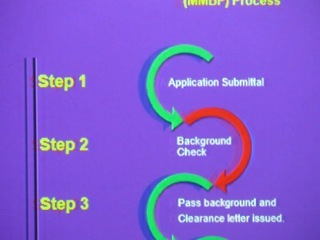 The message that was sent, loud and clear, throughout this entire meeting was that background checks were going to be major hurdles that the applicants will have to deal with. They were advised to be sure they and their business partners were "clean", and if there's a blemish on their record it needs to be resolved or don't bother applying. There was no ambiguity on this issue. Willa Bowens-Killean went through the process for a normal CUP - this is NOT a normal process because of all the governmental clearances required. Gamboa told the crowd that EVERY employee will be required to have a city-issued Identification Badge and must wear it at all times because Code Enforcement, the Police and Fire Department may drop in any time to perform an inspection. Failure to comply puts their business in jeopardy. Francis spoke of the fee schedule, which apparently is not yet complete. Remember, April 18th is the date it will be presented to the City Council. He said the City WILL NOT accept cash payments. Background checks will be conducted by both the California Department of Justice and the Federal Bureau of Investigation. The FBI check could take 6-9 months or longer. Francis guestimated that fees for a new business as defined by Measure X will cost in the neighborhood of $50-$55 thousand dollars, not counting the business license fee of $250. 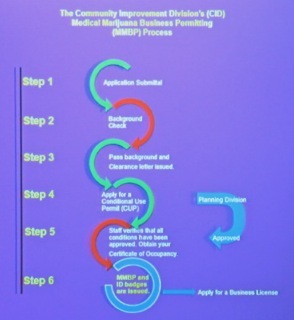 Every two years a Business Permit fee will be required and a Business License renewal will be required every year. Then the discussion turned to the issue of sales tax. Presently it is set at 6.5% of gross receipts, but the council could change that either direction. The books will be audited by HDL periodically. McPherson then reiterated the need for clean records. He advised the audience to know who you're in business with. He emphasized the duration of background testing. Resident and former Planning Commission Chairman Jim Fitzpatrick, apparently now a shill for the dope business, asked about the timeline, and wondered if certain elements could be truncated. He said he was looking for speed in the process - which brought a snappy response from Francis that it wasn't speed, it was marijuana. The crowd erupted in laughter. Fitzpatrick persisted and Francis told him it's not likely because of all the variables in the process, which could take 5-8 months. Francis reminded us that their application packets need to be TIGHT - no holes that could cause disqualification later. He reminded them that none of the fees are refundable. He said the objective is to weed out the reckless operators... again, the crowd laughed. In response to a question he said that the tax would probably be due quarterly, but that, also, is still an open question. Then there were several questions about non-solvent and solvent processes... have no clue about that. Apparently it's a method of processing. Apparently a process using ethanol extraction may be used in Costa Mesa. That fact caused more murmuring in the crowd. 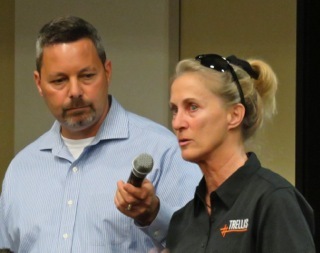 Concern was expressed about the hiring process for new employees. Francis assured us that it might only take 10 days or so. Questions were asked about third parties in the facilities - contract maintenance personnel, cleaning crews and consultants who might be in the facility providing some kind of support. 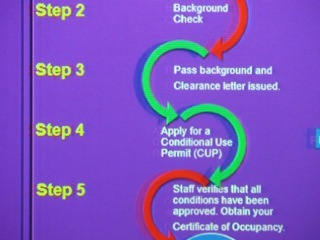 Each will be required to have a business ID badge - not the city-issued badge - and will be required to show it. Some kind of a sign-in process will be required and will be audited. It is not the intent to allow "consultants" to slip around the identification process. Some members of the audience questioned the cost recovery process and the $50-$55 thousand dollar fee. Francis explained the many city hands that are involved in this process, each of which costs money. The City expects the fees to cover all those costs. At one point an audience member asked if they could kick in some cash so the City could hire more staff to move the process faster. That concept was rejected. That fee is due in segments, at certain points along the approval process.. it is expected that about a quarter of the fee would be paid up front and the remaining segments later as progress is made. 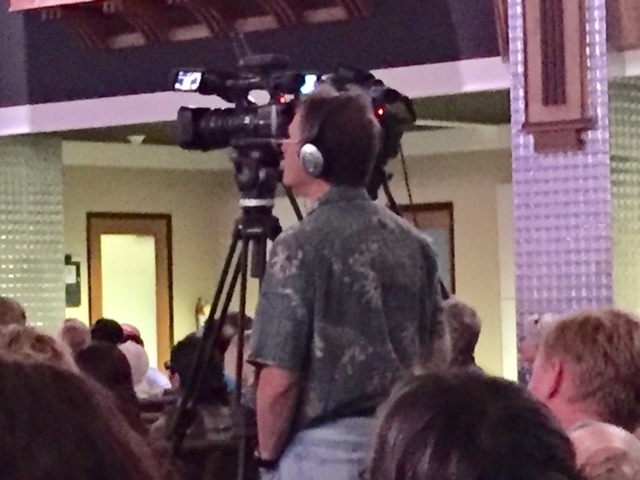 Francis reminded the audience that Costa Mesa has a very low CUP fee for most businesses - it's way out of date. However, THIS CUP process WILL pay for itself. Some asked if there's anything they can do to begin the process now. The answer was NO. 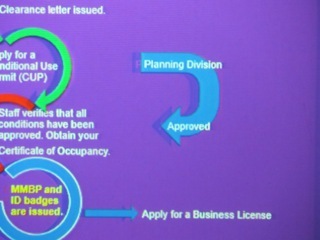 There is a CUP application online, but an addendum will be posted for these types of businesses. Another person asked how they planned to handle "delivery" - apparently meaning delivering marijuana to Costa Mesa addresses. 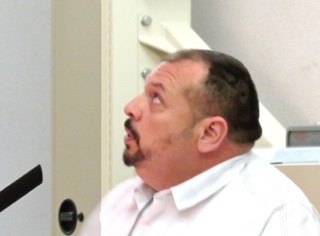 Francis reminded them that the sale and cultivation of marijuana is still illegal in Costa Mesa and that the kind of "delivery" he was describing would be forbidden and subject to law enforcement. When the question was asked about how these fees compare to other CUP fees we were told those were typically in the $1,500 range. 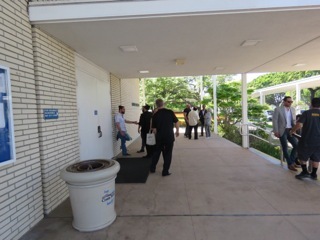 At 3:05 - an hour into the meeting, with a half hour left, it was though someone rang a bell. All of a sudden first 8, then 10 then eventually around 20 people stood up and left the room and decamped to the porch where they chattered away among themselves. Apparently they'd heard enough. 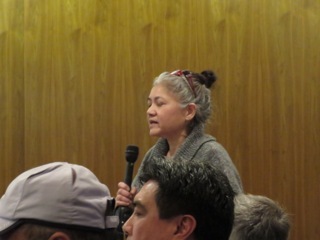 Resident Sue Lester - former pot purveyor - arrived late but stayed to the end and spoke twice. She wanted to be sure the City did this right. She was concerned about the compliance policy, voicing the opinion that it should be 100% - no exceptions. As I had looked around the room during the meeting, and based on many of the questions asked and the reactions to the answers, I found myself thinking that many of those in attendance have a problem with "rules". I guess we'll see. Later, in response to a question about marijuana grown in laboratories for research purposes, Francis reminded those remaining in the chambers that growing marijuana - cultivation - is forbidden, as is retail sales of marijuana products. "GOT OUR BACK IF THE FEDS BUST US?" Another person asked if the City "Will back us if the Feds come calling?" Her point was that if they followed all the City rules and still got busted by federal authorities the City should defend them. 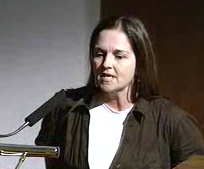 McPherson replied that we have no control over what the federal authorities do. Fitzpatrick again asked if there was a way to truncate the process - he's a slow learner. The answer was still NO. Francis wrapped up the meeting at 3:30 and most departed. 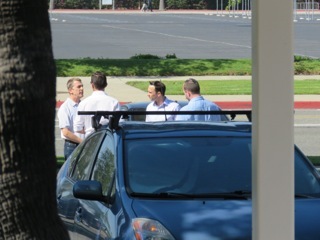 Many hovered around outside in small groups, chatting. A few, including members of the press who were present, stuck around to get some more answers. Gamboa was a very popular guy as applicants peppered him with questions. Here's my take on the meeting. I've never been in a meeting where those conducting it had to constantly remind the attendees that they need to be "clean"! I was amazed that those leading the discussion found it necessary to admonish the attendees that they need to carefully vet their partners in their enterprises lest they lose a lot of money if one of them turns up "dirty". This is just not in my realm of experience. I don't like the fact that Costa Mesa apparently is about to become Marijuana Heaven, where those interested in advancing the "product" will find a safe place to create new products. Yes, I know... it's now the law of the land for adult recreational marijuana and, yes, I know there are those who benefit from the administration of medical marijuana... I get it. I got the sense, from the questions asked and reaction to the answers, that many of those folks who crowded into the chambers this afternoon were looking for ways to game the system. I also got the impression that our city staff, as hard as they've worked on this problem, are not really prepared for what's to come. They didn't have enough answers to very important questions, particularly since this thing is about to get launched on April 18th. We don't have enough staff - code enforcement, fire and police - to properly enforce our laws. We don't have enough staff in the planning area to handle all this paperwork on a timely basis. We don't have enough staff in Building, Inspection and Engineering. And, in that arena, we don't have a full-time Director of Development to guide this process. Yes, Jay Trevino is a superstar - but he's a consultant, without any kind of a vested interest in my city. We are ripe pickin's for the kind of sophisticated operators I saw in that room tonight to take advantage of us in many ways. So, I'm worried about the future of the north part of town. I'm worried for the rest of us, too. This is another flim-flam conjured up by Jim Righeimer that he will leave in his wake. If we're going to do this we should squeeze these "businessmen" until it hurts! That "$55 thousand" number probably should be $100,000! And, there MUST be a ZERO tolerance philosophy for these businesses. NO transgressions - not a single one! I'm thinking that the good folks of this city need to express themselves to their elected leaders via email, telephone calls and/or presenting themselves before the City Council on April 18th. Now is the time. 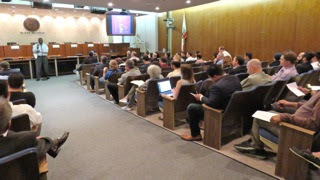 The video coverage of the recent Joint Meeting with the Costa Mesa City Council, Planning Commission and Parks and Recreation Commission that discussed the Lions Park Project - the project that will demolish the existing Neighborhood Community Center and build a new facility that will become a new Library and subsequently re-purpose the existing Donald Dungan Library into an new community center - and free-up an acre of new park land - is now available for viewing. Here is the playlist for replay of the event on Costa Mesa TV - Channel 3 on Spectrum Cable and Channel 99 on ATT UVerse. And, for those of you who wish to view this meeting on your computer, you can find the link to that episode HERE. This meeting is just under five hours long, but worth the viewing if you care about how we're about to spend $35 million of your tax dollars. Enjoy.